Host: Welcome back. We have additional guests. Tsang Sifu (male). Ming Sifu (female). Both are LT’s “toe soon”. Please call our station with some questions. We already got a lot of questions from the audience. One person wants to know if WT training will build big muscles. LT: You can become stronger from WT training but you do not gain big muscles. If you want big muscles then just lift weights. Host: All three of you look very healthy. (She rambles further about asking people to phone in with questions) … We have another question. Is it possible to train Yoga and WT together? LT: You certain can train both at the same time, but I don’t think it is necessary to train Yoga because of WT. 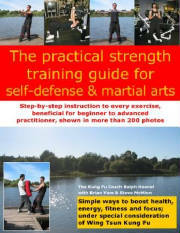 Although WT is a combat art (activity), but practicing WT can also improve your health as well. Our first form, the Sil Nim Tau. Let me show you a little bit. 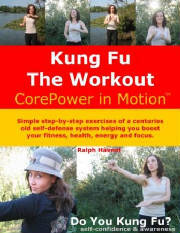 The first form can also help train our internal kungfu (nei gong). On the mainland, they call it Qi Gong. Look at my palm and how it changes. Host: This is Qi Gong? LT: Now look at the changes to my palm. Host: Look at here or there? LT: Look at my whole palm. Host: What am I supposed to look for? LT: Look at the colour. It is getting darker and darker. Host: Woah! It is really happening. How can this be possible? Very mysterious. LT: Touch here. Does it feel cold? Look into the monitor screen. You can see it, right? Host: It was pale before. LT: Right. Then I take it back (he does the huen sau). Host: Wow! It is pale again. Very mysterious. How is that done? LT: My yunqi is very relaxed. Under certain circumstances, the yunqi is very natural. Host: How long do you need to practice in order to be able to change the colour of your palm? Host: What will it take for those of us who are “not too dumb and not too bright” to learn this (laughing). LT: In WT, there are two important words “Yi Li” (intelligence) and “Heng Xin” (perserverance). If you understand the meaning of each then you’ve got it. Host: I have grasped half of each. LT: Well, then you’re an expert already. Host: I will practice daily for an hour. Host: That sifu must be you. After the show I am going to sign up. LT: Thank you. (laughing). He is going to teach you how to raise your fuqi or gongli. How to do that exercise. Host: To learn how to change the colour of my palm, how many years of practice is necessary? LT: For most people to be able to blacken the palm like me is not easy to achieve but to change the palm to a red color takes a week. Host: Wow. Looks like there is hope for me. I thought it is very complicated but if one can get the palm to turn red after a week…. (interrupted by LT). LT: Because in China, we have had the concept of nei gong over 1000 years ago. Back then, we did not call it nei gong or qi gong. We called it “Dao Ying”. (LT goes on to explain in detail the meaning of Dao Ying from 7:09 to 7:51. Too complicated to translate). LT: Chinese people describe Qi as energy. It is not air. But energy is not like rays or beams that shoot out from your body. If we can exert beams of energy then why waste our time practicing on the sand bag every day? It is a health exercise. Host: It is also a type of Qi Gong? Host: Here is another audience question. Can WT enable one person to fight off ten attackers? This must be a question related to the Yip Man movie. Host: It depends on the quality of those 10 attackers. If they all are like me who don’t know kungfu, then I am sure you can take on 1000 attackers. LT: 1000 attackers is impossible. Let me tell you, in many movies….which I have said before… movies are movies. You said to fight 10 at once, who are these 10? If you fight ten 10 year olds, the of course! I think it is impossible. We have new students come to sign up and they ask, “Sifu, after half a year of lessons, how many attackers will I be able to fight off”? Host: Who asks you this? Host: Everyone is welcome to phone in and field questions. Ting Boguang writes, today’s guest sifu is amazing. Can he demonstrate a few moves? Host: In a few moments I will invite Sifu to demonstrate. Do we need to bring out a wooden dummy? LT: A wooden dummy is not required. Host: We are going to keep the audience interest alive. Later we will have Sifu LT demonstrate a few moves. Don’t go away. Siji ask, “Does it take a long time to learn WT to become a good fighter”? LT: No, because I have taught military Special Forces overseas using five days classes. But each class is five to six hours long. Host: After 30 hours they can grasp the basics? LT: Yes. More over, it depends on what is the topic because many traditional sifus stretch out their teachings. Teaching the Sil Nim Tau over and over again. That is not right. In WT, it depends on how you teach. So who is the Sifu is important. Host: Hmmm… teaching the skills. LT: Skills is only one aspect. The other is theory. Why do I punch this way? Why do I block this way? Why do I not block this way? Why should I not strike this way? This is the most important. This is at an intermediate level. Advanced level we begin to see that I can’t hit this way but I can get thru to hit this way. Host: Do you WT people focus only on using the hands but not any footwork? Host: He only studied for three years? Host: He studied in Foshan or in Hong Kong? LT: He studied in Hong Kong. He went to his Kungfu brothers for sparing practice. So later, some say he was 15 or 18 years old when he went to America. Of course, he did not get to learn WT’s footwork. Host: It seems Bruce Lee’s kungfu was different from Wing Chun, is that right? Host: He created his own martial arts, right? LT: He created his own thing because he believed WT was focused only on the hand work but forgot about the footwork. Actually WT covers the “Shi peng gong fu” (not sure what this phrase means): footwork (bu fa), body work (shen fa), stance work (ma fa), leg work (jiao fa). All this is very high level theory. University level … professor level stuff so to speak. Host: So the basic defensive kungfu is taken care of thru hand work, right? LT: Traditional WT only teaches the handwork but don’t teach the “Shi peng gong fu”. So even today, many people think WT hand work is good but the foot work is not good. They misunderstand. Host: Because so few people are able to demonstrate foot work. All show hand work. LT: It is like saying that most that you run into among the crowd are at high school level. How many doctors or professors have you seen (met)? Program takes a commercial break starting at 4:28 (move to the next clip). LT: When Liang Bo Chou taught his nephew Liang Langui, he called the art Wing Chun’s art. Liang Langui taught an opera actor named Huang Huabao (Wong Wah Bo). Some where along the way as the art was passed down, it changed from being called “Wing Chun’s martial art” to simply being called “Wing Chun”. Host: So generally how old are your students? Are there more children than adults? LT: Generally not too many children because our martial art tends to be a “thinking man’s” art. For example, “Why do we have to strike this way and why do we have to block this way”? So that is why WT is different from other martial art styles. Host: Oh. So, you have to do some thinking? LT: Yes. “Why is there this reason/purpose and why is there that reason/purpose”? So WT is different. Host: So practicing this martial art not only improves your fitness and health, it also helps improves (nurtures?) the mind, right? LT: Yes. You could say that. I think it is most appropriate to begin learning WT after the age of 10. Host: You would advise to start learning WT after 10 years old? LT: Yes, because if you are too young you would not be able to absorb anything. For example, GM Yip Man told journalists that he did not begin lessons until he was 11 years old. (LT pulls out his book to show the host). Host: What is the title of this book? LT: Roots and Branches of Wing Tsun. 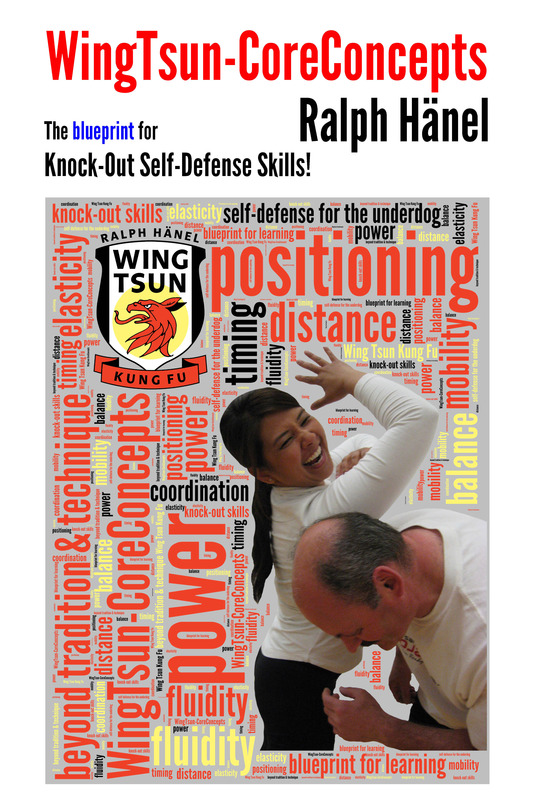 Host: Roots and Branches of Wing Tsun. Let’s show them (the audience). You wrote this book? LT: I spent 18 years and interviewed countless number of WT persons to produce this book. Host: Wow. You spent 18 years to work on the book? LT: Yes. Look here is a chapter. Host: Wow. This book is a treasure! Can we buy it? LT: Yes you can, in Hong Kong bookstores. LT: From bookstores. Let me show you. LT: Yip Man said…. eleven years old. That is where he told the journalist. Some people claimed Yip Man started learning at age 7. That is impossible. Host: As you’ve said. This requires some analytical ability. It is impossible at such as young age. Host: The text is pretty small. (Probably LT is showing her page 176 of the book where it is a photo of a magazine article). Yes. It says here “11 years old”. This book proves it. He began lesson at age 11. How many years passed before he became a Sifu? LT: He began learning at age 11 but his Sifu died when he was 13 years old. LT: His Second Sihing took over teaching him. His Second Sihing (Er Sixiong) was named Wu Zhongsu. Actually, when he sought Chen Huashun as his Sifu, Chen Huashun already had a stroke and was pretty immobile. Host: You can still succumb to a stroke despite knowing WT? LT: Chen Huashun loved to eat too much. He was very fat. Moreover he was already over 70 years old. Back then, people were not aware of such diseases as high blood pressure. If they encountered health problems such as loss of energy or mobility, they brewed remedies (“bupin” - difficult for me to translate but basically Chinese herbal concoctions that are designed to restore vitality or energy to the blood). Taking such concoctions only made things worse. Right? So, it was mainly his second sihing who really taught him. At 16 years of age, he came to HK. Host: He came to Hong Kong at age 16? How come that is different from the movie? LT: Reality and the movie are totally different. LT: For example, in the movie, Yip Man shoveled coal. (LT and the host were making a joke /play on words “Dao Mei”. The phrase “to have bad luck/to be unlucky” sounds the same as “shoveling coal”. LT points out in the movie Yip Man was really unlucky because he was broke and needed to work in a coal factory to get by). In reality, Yip Man never worked at a coal mine/factory. In Fatshan (Foshan), Yip Man only worked three years as an undercover police detective. Host: Why didn’t the movie portray that? LT: The movie changed things. We needn’t bother. Host: So basically his life was not like that? Host: While watching the movie, I cried because I felt really sad about his situation. But in reality it was not like that! LT: His characteristics…..since I’ve been with him for a length of time so I know his character well. He had “Four No Teachings” (Si Bu Jiao). LT: [There is a lot of joking back and forth here between LT and the host so I will keep this translation of this part of the dialogue simple because I think most of us can figure out why] (1) No teaching clever people (2) No teaching stupid people (3) No teaching rich people (4) No teaching poor people. LT: I think Yip Man would be happy to teach you. Host: The audience has sent a lot of questions to us. A lot have asked if the Yip Man movies are real or not. If you keep telling the truths, the audience will be so disappointed towards the movie, especially the second one will be out soon. LT: The second movie is completely false. Host: The audience will be so disappointed. LT: Are you familiar with the stories of Huang Feihung? He never actually had that many fights. Host: So for this movie who provided the research? Host: Did Yip Man’s son provide any information to the production of this movie? (she is referring the first Yip Man movie starring Donnie Yen). (I am not sure about my translation of the next three lines). Host: ….can’t possibly allow them to do whatever they want. LT: I feel most movies are following a much commercialized formula / process. Do you agree? Host: Perhaps the commercialized process is to give the audience a fantasy with emphasis on entertainment. LT: Yes. Moreover, like the San Guo Yanyi (Romance of the Three Kingdoms). That is not real. LT: There are more people who have read the Romance of the Three Kingdoms compared to the number of persons who have read than Record of the Three Kingdoms (San Guo Zhi). Host: Because Romance of the Three Kingdoms was more fun to read? Host: Audience member NuNu writes - Today an important Sifu is here, we are so happy….